The Allen County Indiana Bar Association provides educational, social and professional opportunities for members of the legal community in Allen County and surrounding counties. We are dedicated to providing support for area attorneys, judges and paralegals through continuing legal education programs, active committees and legal interest sections. The practice of law in Allen County was established by the activities of the Allen Circuit Court in 1824. Judge Bethuel F. Morris, a resident of Indianapolis, “rode circuit” and presided over the Allen Circuit proceedings, with the assistance of two associate or “side” judges, who were elected from the County and who were not required to be lawyers. The practice of law flourished in the County after the establishment of the Circuit Court and as settlers arrived in the 1800s. 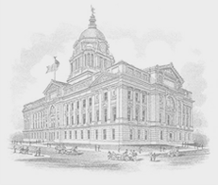 The Allen County Bar Association was established in 1890. The elected presidents administered the Bar Association from their personal law offices until 1956 when the Association established its own office. In 2000, the Association moved into their current headquarters located at 924 South Calhoun Street. ACBA offers numerous opportunities for live, online and video continuing legal education programs. Offerings include one-hour section luncheons as well as one and two-day programs. The New Lawyers Section hosts an annual Applied Professionalism program. ACBA members receive a substantial discount on the cost of all CLE programs. The ACBA is actively involved in the community. Every Tuesday evening, you can get free legal advice by calling (260) 423-2358. ACBA members volunteer with the Volunteer Lawyer Program of Northeast Indiana and Neighborhood Christian Legal Clinic. The ACBA is committed to a high level of professional courtesy among our members, the courts and with others who interact with the legal system. We are dedicated to our ‘Commitment to Professional Courtesy’.